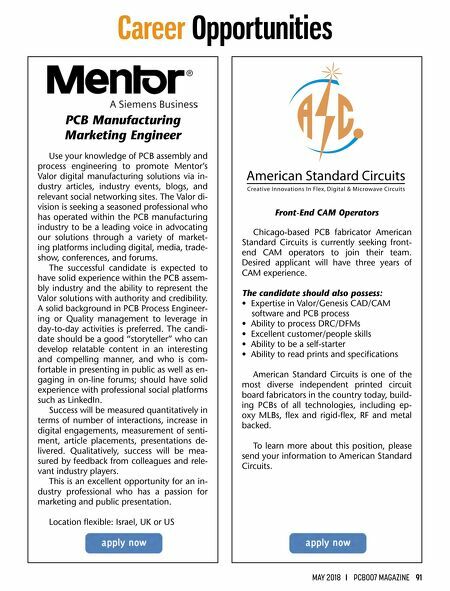 90 PCB007 MAGAZINE I MAY 2018 Career Opportunities New Business Development Representative for USA market Taiyo Kogyo is a Japanese PCB manufacturer. We started manufacturing PCBs in 1962, and have unique and differentiated boards used in various in- dustry segments. Our products are appreciated for application in power electronics. High current PCB and thermal solution PCBs are our strength. Position Summary: Responsible for creating new business and ex- panding business with existing customers in the U.S. Work at your home office. Part-time (half-day/ 5 days a week) okay. (Option: After first 6 months, job can be upgraded for full-time work based on per- formance.) Responsibilities: • Develop new customers: Work closely with local sales representatives and independently in territories without sales reps. • Educate and support local sales representatives. • Operate as company's U.S. Sales office and communicate daily with Japanese headquarters for smooth and speedy communications with local sales reps and customers. • Travel and visit prospective customers with local sales reps or alone to develop new customers (about 6 to 10 times a year). • Attend company booth at business expo (APEC) during the show. • Search for and appoint competent local sales reps in non-covered regions. Technical Support Engineer, UK As a UK-based Technical Support Engineer, you will help customers choose and optimize the use of Ventec materials in their Printed Cir- cuit Board manufacturing processes. You will provide a two-way channel of technical com- munication between Ventec's production facil- ities and UK/European customers. You will be required to undertake some laboratory testing (including the use of TMA, DSC, Melt Viscom- eter, Gel Plate Timer, and laboratory scale mul- tilayer presses) and provide appropriate tech- nical support to Ventec UK and European sales personnel to maximize results. Skills and abilities required for the role: • Hold a HNC, HND, degree or equivalent in a technical/scientific discipline. • Excellent communications skills and ability to write full technical reports for group or customer distribution. • Ability to work in an organized, proactive, and enthusiastic way. • Ability to work well, both in a team as well as an individual. • Good user knowledge of common Microsoft Office programs. • Full driving license essential. Appropriate training will be given if required. This is a fantastic opportunity to become part of a successful brand and leading team with excellent benefits. For more information, please click here. 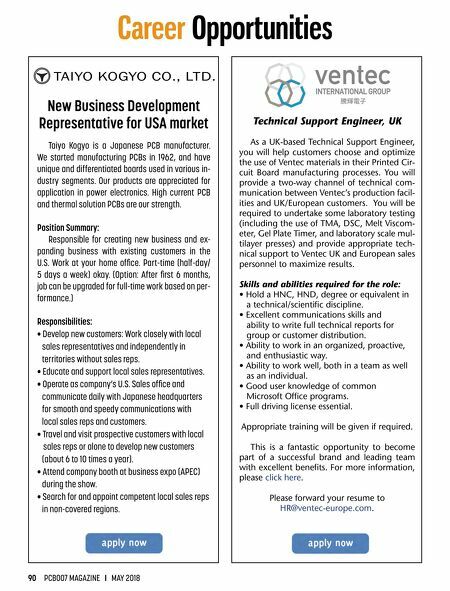 Please forward your resume to HR@ventec-europe.com.